Today I had the chance to talk to three very high-level financial professionals about the upcoming Italian election, which takes place this upcoming Sunday and Monday. Italy has made a lot of progress reducing its borrowing costs, ever since Mario Monti came into power in late 2011. But while borrowing costs have come down, the economy has not picked up, and that’s created a backlash. What you have is a battle between the candidates of “credibility” (like Mario Monti) and the populist candidates, like Silvio Berlusconi, and Beppe Grillo. And though Silvio Berlusconi is a cause for consternation, it was Beppe Grillo that made them appear physically sick to their stomach. Grillo — who is a comedian and the head of his own Five Star Party — offers up ideas that the less-off in the public like, but which sophisticated people know are bunk. Italy has too much debt? Just don’t pay it! Oh and everyone gets a free iPad with free internet (Seriously). JPMorgan has a note out today titled A Crash Course In Grillonomics, which likes the Grillo movement to SYRIZA in Greece. SYRIZA is the left-wing party that came in a narrow second in last year’s elections. 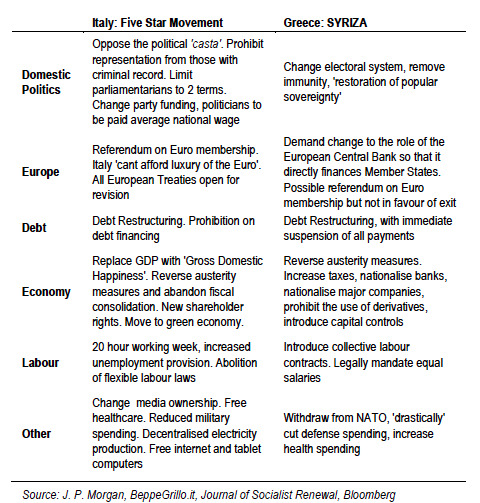 And though SYRIZA is more clearly left wing, both parties have thrived by promising to do the impossible and stick it to the man (although SYRIZA is pro-Euro, whereas Grillo is not). This table put together by JPM has a nice outline of Grillonomics.